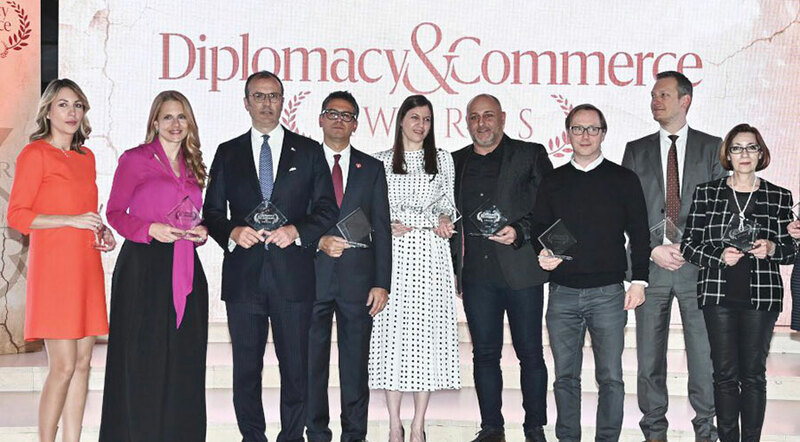 Head of the Delegation of the European Union to Serbia, Ambassador Sam Fabrici is the winner of this year’s special Diplomacy and Commerce magazine award for contribution to the development of civil society. The European Investment Bank was also awarded for the contribution to the development of the investment climate. The magazine marked the third anniversary of the launch with this event. The awards were presented to individuals, companies and organizations that highlighted in humanitarian work, CSR activities, merging businesses and culture, and contributing to the improvement of business conditions, bilateral cooperation, civil society and the economic environment in Serbia. “We still deeply believe that our place is a community of European nations. I take the opportunity to remind you that at this place, in the National Museum where this is best seen, we are reminded that we inherit European traditions and that this is the society in which we want to be in the future, the president of the Color Press Group and one of the members of the jury Robert Čoban said. About the award, Ambassador Fabrici wrote on Twitter and received the congratulations from the Director of the Western Balkans at the European Commission’s Directorate-General for Neighborhood Policy and the negotiations on the extension of Genoveva Riuz Calavera the same way.